Like almost everyone else, I do not enjoy cleaning. Like most people, I find living in filth unacceptable. As such, I need to either clean myself, get someone else to clean for me or change my abode frequently. I have chosen to do my cleaning myself. I was forced to give this matter some thought when, while complaining about cleaning, I was asked why I did not hire someone to do it for me. There are a variety of reasons for my choice. Some are psychological and thus not particularly interesting. Most of these have to do with the fact that my mother would have made Aristotle proud: she was rather big on making sure that I had plenty of character building opportunities and, as such, I now (as per Aristotle’s theory of moral education) find it less irksome to do such chores. I am also quite a character. As a kid, of course, I found such tasks less tolerable—but that is what habituation is all about. Some of these psychological factors are due to the influence of my interpretation of the American ideals of responsibility, egalitarianism, and a classless society: no person should be so full of himself to think that he is above doing his own chores. As far as changing my abode frequently, that would be a bit too pricy for a frugal Yankee like me. But, psychological reasons are not philosophically interesting. So, I now turn to the ethics of cleaning one’s own toilet. Or, more generally, cleaning up after oneself. Turning back to Aristotle, one excellent reason why a person should clean up after himself is that this is a method of building proper habits. There is the obvious good habit of keeping things clean, but there is also the deeper impact on a person’s character. While I am sure that not everyone has been affected in the same way, doing my own cleaning (and other such work) has had two main impacts on my character. The first, to put it bluntly, is that it is hard to be too full of yourself when you are scrubbing your toilet or toweling up some husky vomit. My detractors can certainly imagine how arrogant I would be if I did not have these regular ego-reducing activities. To pre-empt a likely criticism, I do not think that cleaning is a “lowly” activity that beats down the ego because it is worthy only of disdain or contempt. Rather, I think that it is doing my own cleaning that helps me not regard cleaning as something disdainful or worthy of contempt. It is usually not a pleasant activity, but it is both necessary and worthy of respect. As such, it is not that the cleaning helps me remember that I am not too good to clean, it is that such work should not be held in contempt. This helps keep the old ego under some degree of control. The second is that cleaning up my own messes (and those of various pets) has taught me to be more considerate of others. Knowing how much fun it is to clean up a mess, I am certainly not inclined to make messes for others to clean up. As such, I do not litter and I am respectful of public places. After all, normal cleaning is work enough. In contrast, there are folks who are fine with creating awful messes. I have had to clean up a few of those myself—like the time I had to clean up discarded diapers left by trespassers at the homeowners’ association pool. I did not have a problem with people outside of the association using the pool in the hot Florida summer, but did have an issue with cleaning up their mess. I will freely admit that there are people who do not learn such lessons from cleaning—but that is true for all lessons. You can lead the person to the mop, but you cannot make him learn from mopping up husky vomit. In addition to the character building value of such tasks, there is also the matter of moral responsibility. When I was an infant, I was not accountable for my actions—I lacked both the knowledge and control to be responsible for the messes I produced. However, once I had both knowledge and control, I became accountable for my actions. This accountability includes the messes I create—be it mud tracked in from a run or screwing up something at work. To not clean up my own messes would be morally irresponsible and thus worthy of moral condemnation. Despite the fact that I find my view sensible, it does face some reasonable objections. I will focus on moral arguments aimed at showing that it is morally acceptable for a competent adult to have others do her cleaning for her. While it is just me and my non-cleaning husky living in my house, I have lived with people before and I am familiar with the challenge of sharing the chores. I am fine with sharing chores on the basis of my responsibility argument. However, I am aware of an interesting argument in favor of having one partner doing the cleaning. Consider, if you will, a situation in which one person makes significantly more money than her partner. Her time is thus more valuable than that of her partner, especially if the time she would otherwise spend cleaning is spent earning money. Since the partner’s time is literally worth less, it makes more economic sense for the partner to do the cleaning. This does have considerable appeal that is grounded on smart use of employee resources. To use a concrete example, if the toilet overflows at a small law firm, it makes more sense for the least valuable employee to deal with the toilet while the more valuable employees keep racking up those billable hours. The loss of revenue is less this way. The obvious counter to this, at least in the case of people who are in a relationship, is that the value of each partner’s time as a person is not a function of her work salary. While it is something of an ideal, a person should value his partner’s time on par with his own—or someone should re-consider that relationship. There is also the matter of respect—to regard a person as being worth less simply because she makes less money is to fail to respect that person as a person. As such, chores should be divided fairly. This can include dividing the chores based on each person’s cleaning skills, preferences and level of mess creation. For example, if one person has a habit of creating muddy messes on the floor, then that should be his responsibility to clean. But, to the degree that each person contributes to the mess, each should contribute to the cleaning. There can, of course, be some “exchange” of chores—but the responsibilities should be shared based on the principle of fairness. As mentioned above, what caused me to reflect on this was being asked why I did not hire someone to clean for me. Obviously enough, hiring a person to do the cleaning is morally different from having one’s partner do the work. The easy and obvious moral justification for this is one of utility. If a person values avoiding cleaning more than what it would cost to hire someone to clean, then it would be reasonable and morally fine for him to do so. This is no more morally problematic than hiring someone to perform a root canal or argue a legal case. This assumes that the person is not coerced and is being paid a fair wage—if this is not the case, then another moral concern arises. I must admit that this is a sensible view. I certainly hire people to do work for me, such making and installing the dental crown I recently had to get. I have also hired people to take care of my pets when I am out of town, thus paying someone else to take care of my responsibilities. However, in these cases I am hiring people to perform tasks that I cannot perform (or cannot perform as well). I am not paying someone to avoid something I am responsible for, namely my messes. As such, I think part of the cost of hiring someone else to clean up after me would be moral costs: failing in my responsibility when I could fulfil my obligation and engaging in behavior that is not good for my character. Put another way, I think that the lesson that you can make whatever messes you want as long as you have enough money to pay others to clean it up is the wrong sort of lesson. A sensible reply to this is that any alleged moral harm done to the person doing the hiring is offset by the good done at creating a job for someone. After all, there are people who make their living cleaning up other peoples’ messes and if everyone had my view, these people would need to find new work or be unemployed. This, I admit, is certainly an appealing argument. At some point, probably when I finally get sick of scrubbing toilets and mopping up pet puke, I might let it convince me. But until then, I will keep making my mother proud and build character by cleaning my own toilet. Until mopbot arrives, most likely followed quickly by the killbots. 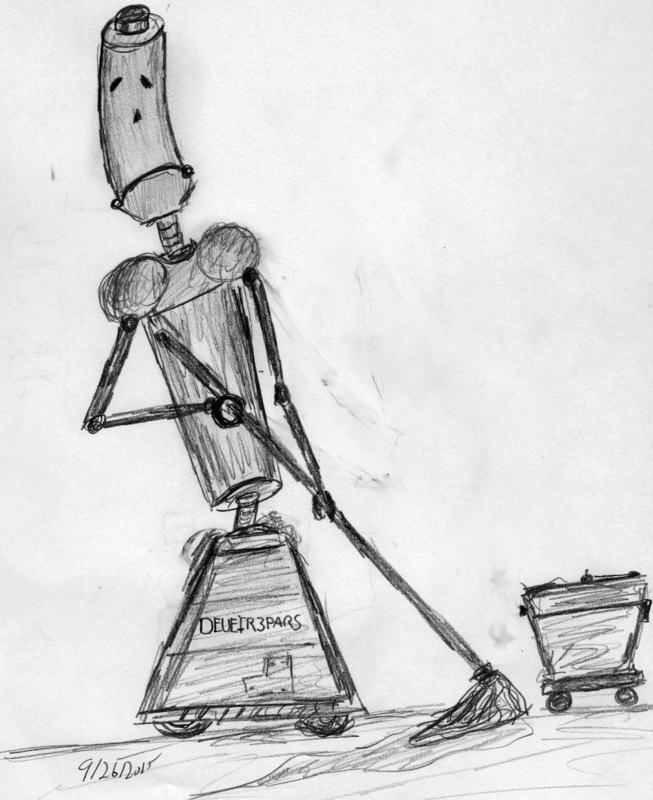 Who will no doubt make the poor mopbot clean up my remains.